« What A Way To Spend A Weekend! Sometimes you look forward to a weekend and hype it up so much in your mind, that it inevitably falls a little short of expectations. That did not apply to this past weekend. 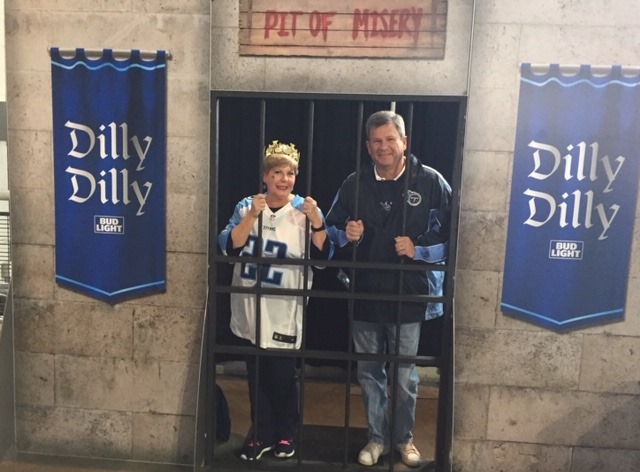 Of course, the original reason for this trip was the Titans-Colts game – but that didn’t work out so well. Even with a horribly embarrassing performance by the Titans, it was still a great weekend. 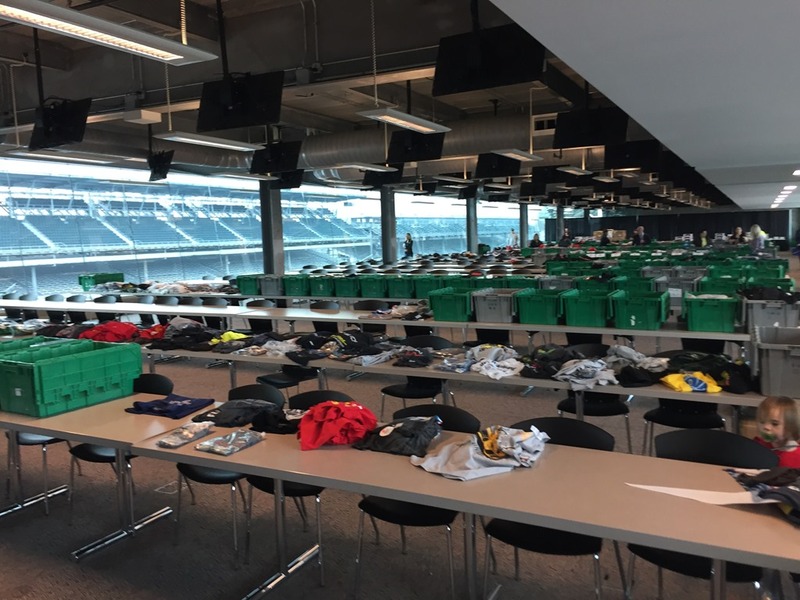 Shortly after I posted our weekend plans last Friday, several of you let me know that the year-end merchandise clearance sale at IMS was going on this weekend. We arrived at the track around 3:30 Saturday afternoon and it closed at 4:00, meaning that a lot of the good stuff was gone by the time we got there. It was held in the vast Media Center where we tend to spend a lot of time each May. Gone was the familiar interview stage where all of the press conferences take place throughout the month. Instead, it had been replaced by a row of cash registers where you paid for the heavily discounted items. On all of the tables where everyone is assigned a seat in May sat bins and bins of polos, T-shirts, jackets and sweatshirts from seasons past that had not sold out. On other tables were die-cast cars that they were trying to unload at a substantial savings. I bought a few items, but I know Susan had a whole bag of stuff that she wouldn’t let me see – so I’m assuming that a lot of my Christmas was purchased on Saturday. The biggest surprise of the weekend came Friday morning. 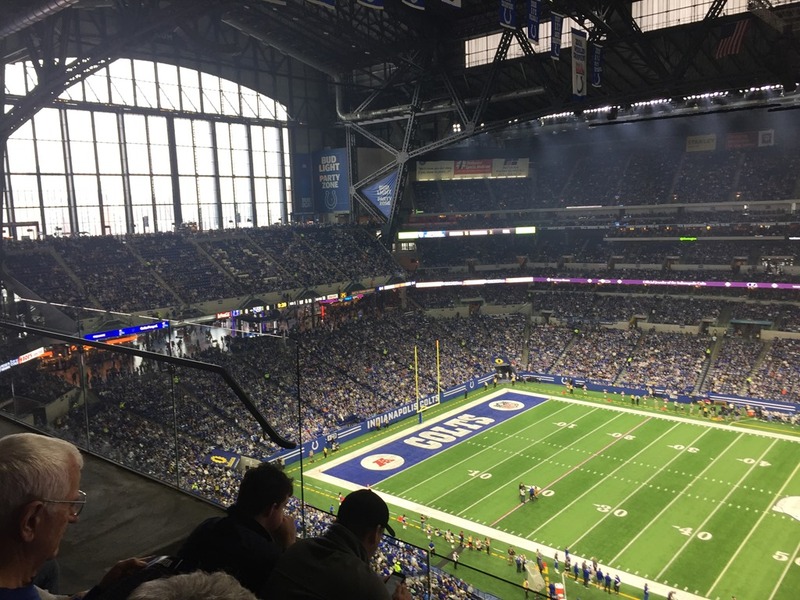 Loyal reader and longtime commenter, Brandon Wright, read here on Friday that we were going to forego the Lights at the Brickyard in order to save some money for our dinner at St. Elmo Steak House on Saturday night. Many of you probably saw the comment where Brandon told me to check my e-mail. 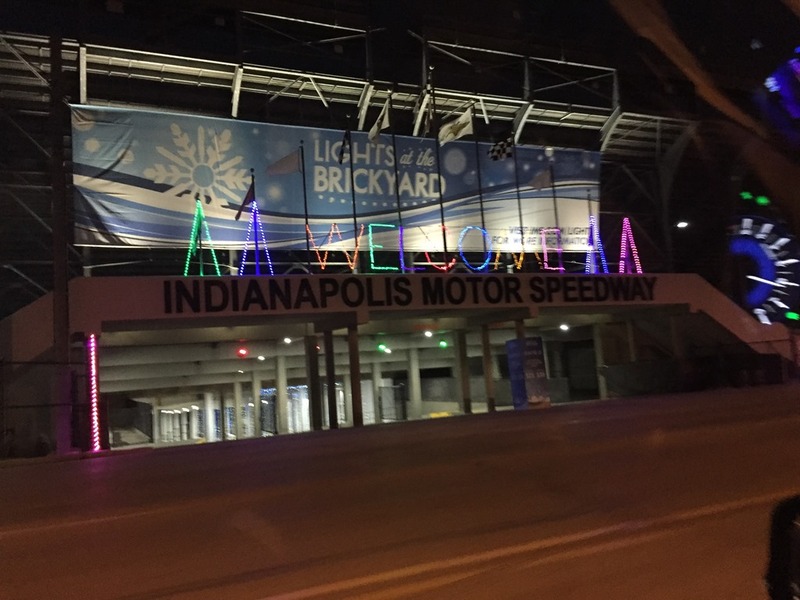 When I did, Brandon had sent Susan and me a Speedy Pass for Lights at the Brickyard. He offered it up as a Christmas Gift for the two of us. Quite honestly, I felt overwhelmed at the thought of this. Over the years, I’ve received many gifts and perks from readers of this site. I’ve had books sent to me from as far away as the UK. Another reader and his wife sent me the three-volume Smokey Yunick’s Best Damned Garage in Town for a wedding present in 2012. That doesn’t even mention the still unnamed sponsor that allowed us to get married in their IMS suite and gave us two-seater rides and the chance to wave the green flag on Helio’s qualifying run at Fontana in 2013. I never met Brandon until last spring, when he and I met at the IMS open-test in April. Not to minimize what others have done, because I very much appreciated each one of them and always will. But this wasn’t sitting around his house, nor did a corporation pay for it. He read that we weren’t going to do something because we needed to save money. It immediately struck him to reach into his own pocket out of the goodness of his heart to make sure I got to experience everything I could this past weekend. Thank you, Brandon. It was greatly appreciated. The pass went to good use. 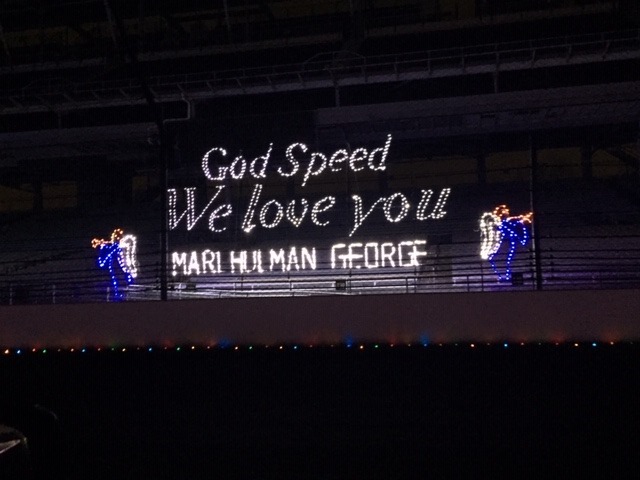 If you’ve been to Lights at the Brickyard before, there are some new displays for this year – most notably the Borg Warner trophy done up in a huge display of lights along the main straightaway, as well as a tribute to the late Mari Hulman George. It was not as cold as it was last year when we went with snow on the ground. It was a rather balmy 42° when we went through. We got there at 6:08 pm, just eight minutes after it started. 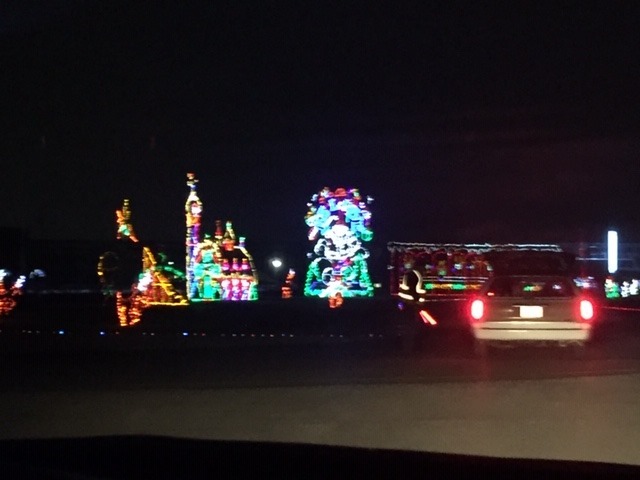 With it being only the second night of the season and early in the evening, there were only a few cars in front of us and the one behind us was stopping at every display. That meant we could go through at our own speed to check out all of the displays (and even take a few of the road course turns probably a little faster than track officials would like). But of course the biggest thrill was coming onto the main straightaway just past Turn Four. 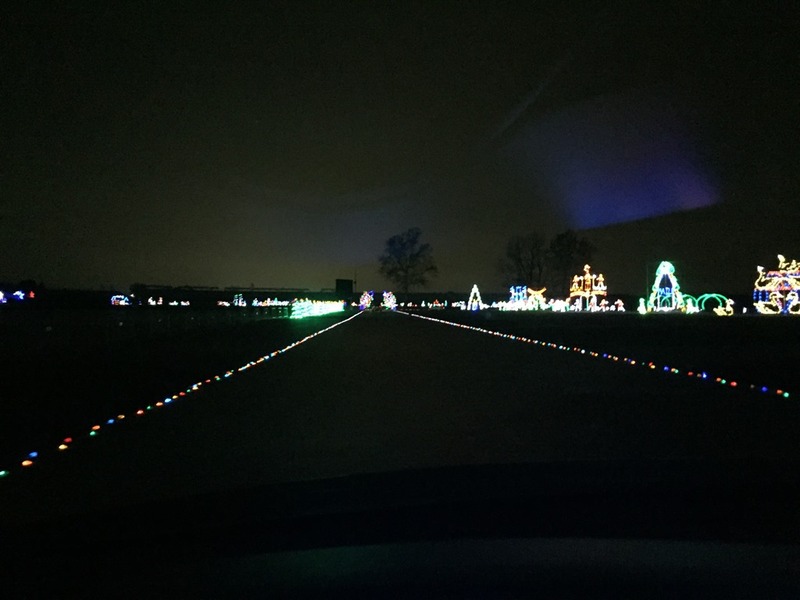 Even though it’s at night and there are lighted Christmas displays in the stands, there is something surreal about being in your own car and looking ahead and realizing that you are on the main straightaway of the Indianapolis Motor Speedway. Just before getting to Turn One, the trail turns at pit-out and leads you behind the F1 garages. 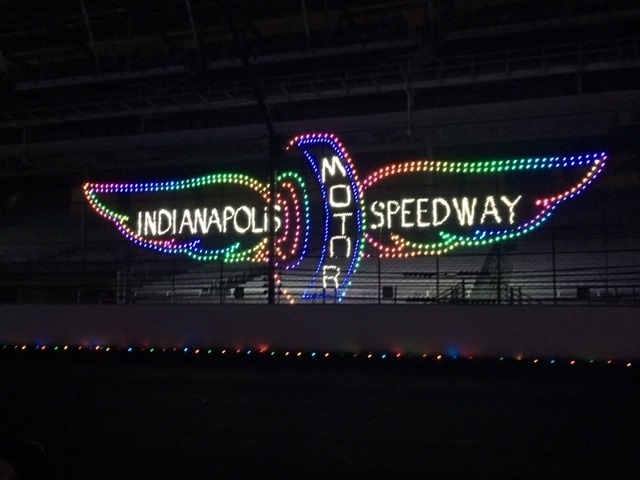 There are more lighted displays there before you make the right-hand turn into Gasoline Alley, where there are displays throughout the garage area. As you exit the backside of the garages, it winds you back to the museum parking lot. Last year, the gift shop was open at night. Saturday night it was not, but I’m assuming that’s because of the sale that went on all day in the Media Center. 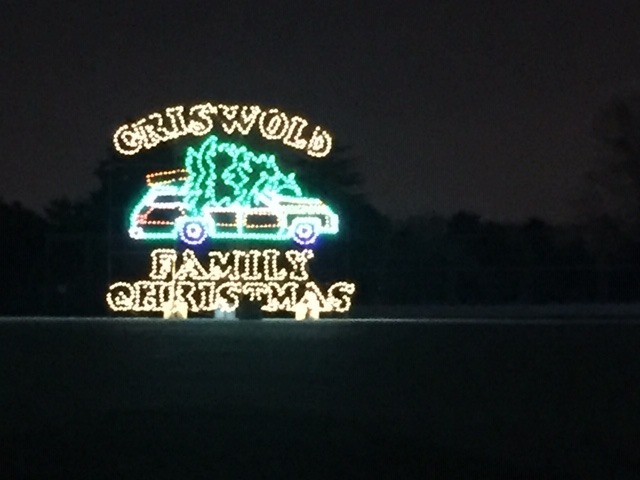 If you have a free weekend and live within driving distance of IMS, I would recommend taking in Lights at the Brickyard. Thanks again for making that possible for us, Brandon. It’s a good thing he did, because we had quite the eating extravaganza later that night at St. Elmo Steak House. Our reservations were at 8:30, so it worked out fine. We both got the famous shrimp cocktail with the seizure-inducing cocktail sauce. To my surprise, Susan liked it. We also got the Lobster Bisque which was phenomenal! It contained large chunks of real lobster (not imitation) and had a great flavor. 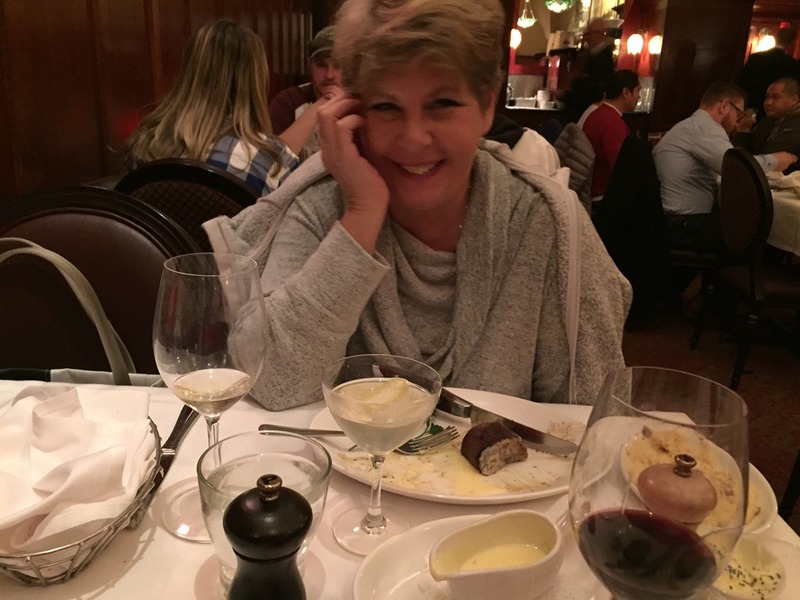 Susan got the eight-ounce filet with béarnaise and mashed garlic potatoes. I had planned to get the twelve-ounce filet, but was swayed by their special offering that night – and eighteen ounce cut of USDA Prime boneless ribeye that had been dry-aged for sixty days; with a loaded baked potato. I’m a sucker for prime beef, but in all honesty – I wish I’d stuck with my plan. Susan couldn’t eat all of her filet, so I polished it off and it was much better than my ribeye, which was surprisingly a little on the tough side. That’s what happens when I live dangerously. We both had a couple of glasses of wine and we finished off the meal by both of us getting the crème brûlée and coffee. Other than my wrong choice of entrée, the meal did not disappoint – and it was well worth the arm and the leg that we paid for it. I had not eaten at St. Elmo since 1995, but if anything – it has improved since then, and I didn’t know that was possible. If you can, go. And then there was the game. I won’t dwell on it here, because it will just make me mad. 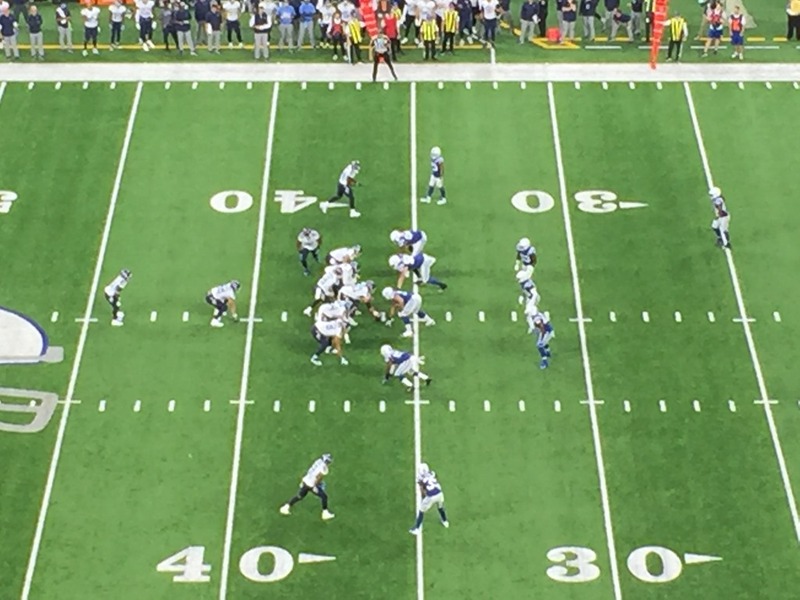 The gist of it was that the Titans were completely dominated by the Colts, losing 38-10 – and it was not as close as the score would indicate. But believe it or not, we still had fun. Susan got us great tickets on about the thirty-five yard line. 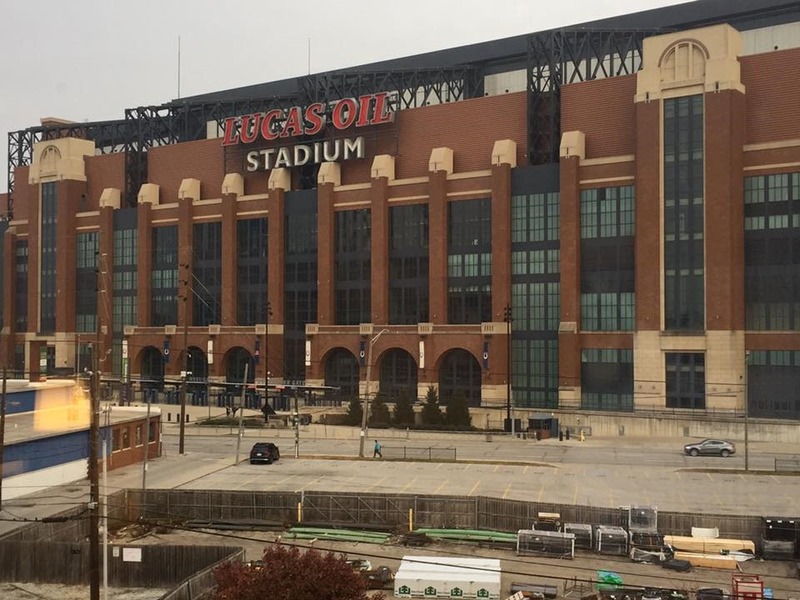 We also used her points from work and stayed in a Holiday Inn directly across the street from the stadium. This was the view from our room, so you can see just how close we were. We got to sleep in and checked out around 11:30. 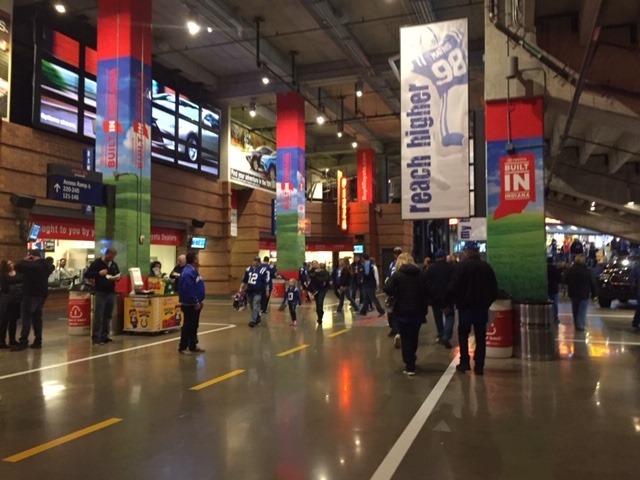 We walked over to the stadium at a very leisurely pace and had time to look around and explore the facility. 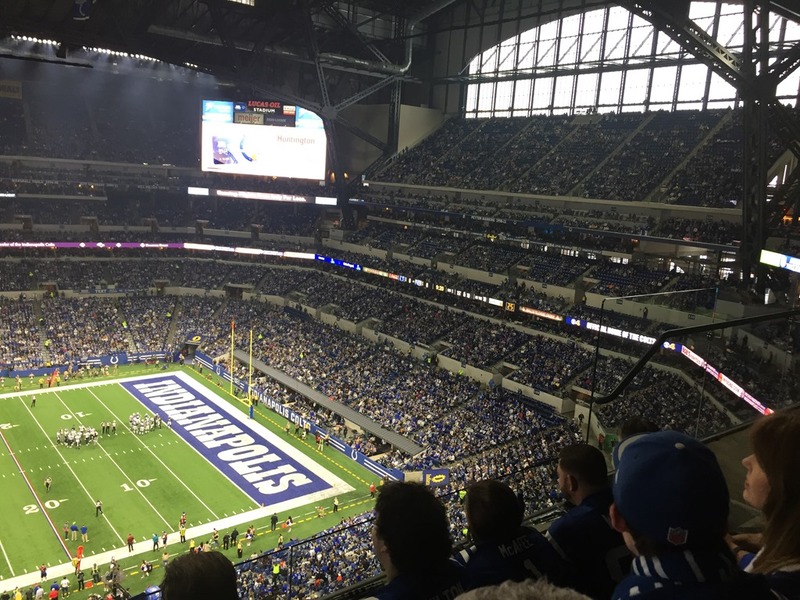 I was very impressed with Lucas Oil Stadium. 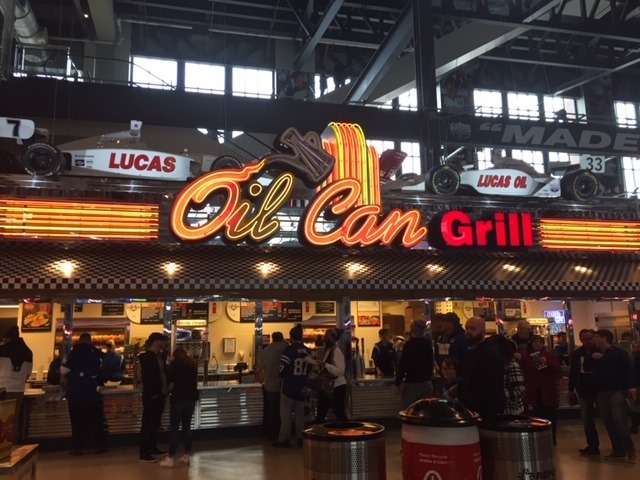 They have concessions at every turn (including a Bud Light Pit of Misery – Dilly Dilly) and the food selection was a lot better than the Titan’s Nissan Stadium in Nashville. Plus on a cold day, you cannot over-emphasize the importance of an enclosed stadium. My only complaint is that with a closed roof and polished concrete in all of the concourses – the place is an echo chamber. It’s really hard to hear, but I suppose that’s the idea. We were able to meet up with some of our racing friends before the game and then we headed to our seats. The game got out of hand early, so we just rolled with it. 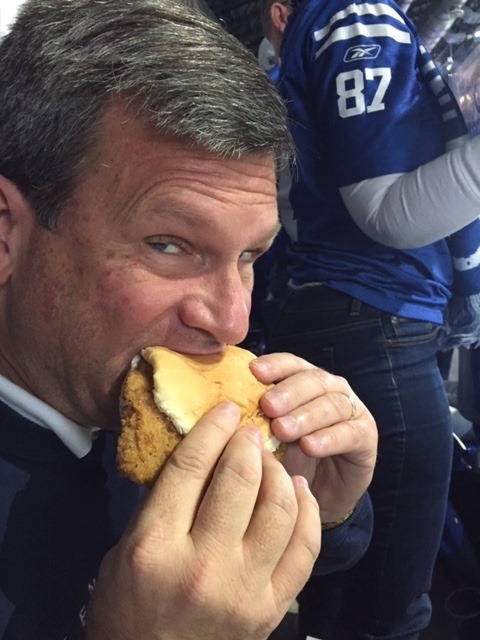 Typical for Indiana, they had a breaded tenderloin sandwich in some of the concession stands. While it didn’t have the seasoning of the traditional jumbo tenderloin at IMS, it was decent and crunchy. Since I haven’t had one since last May, it was good enough for me. In fact, it was so good that we decided to forego going to Dawson’s and headed straight home after the game We had an uneventful drive back to Nashville and got back home around 7:30. If going to IMS is involved, it’s a good weekend for me. 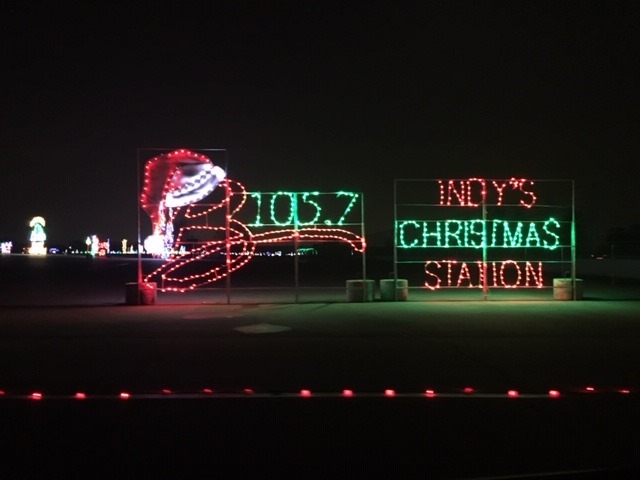 We got to see the Lights at the Brickyard, had an unforgettable meal at St. Elmo and another Titans game that didn’t go our way. I can’t remember the last time I attend a Titans victory in person. I’ve been to two Titans games this season only to see them be outscored in both of them by a margin of 59-10. Oh, well. When you go in with very low expectations, you don’t come away too disappointed. Thanks for following us along on another weekend trip to IMS. After all, it is the offseason. 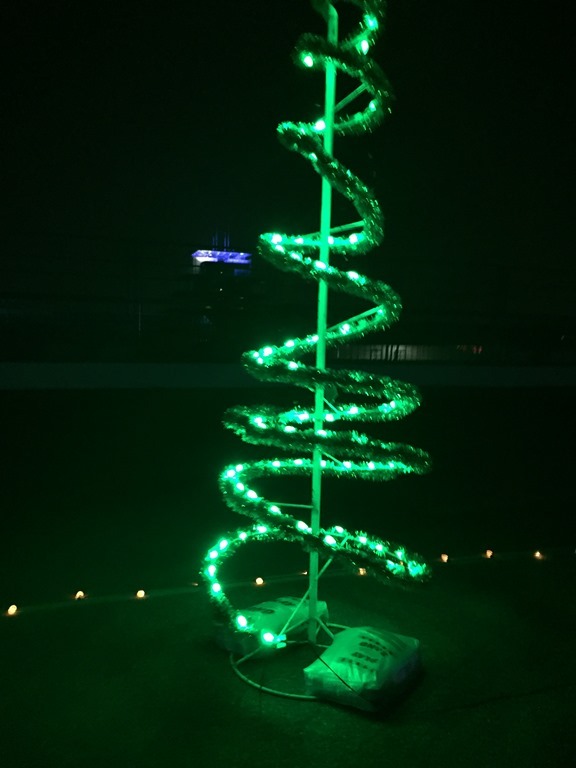 And thanks, once more, to Brandon Wright for his gift that allowed us to see the lights at IMS this past Saturday night. This entry was posted on November 19, 2018 at 3:03 am and is filed under IndyCar. You can follow any responses to this entry through the RSS 2.0 feed. You can leave a response, or trackback from your own site. 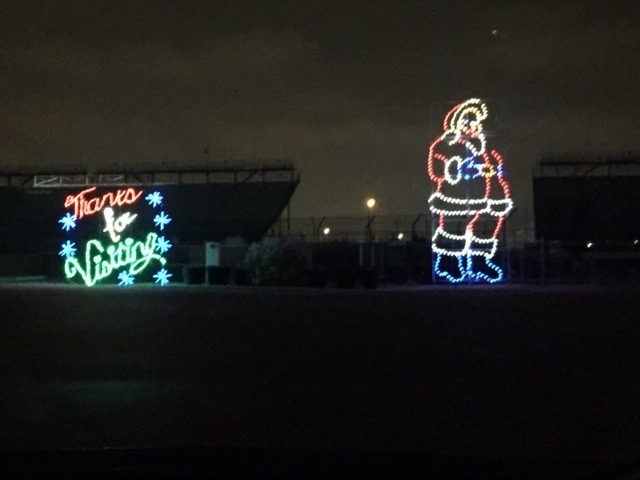 It just didn’t feel right for you two to be in Indy at not see the Lights at the Brickyard! For all you give to us throughout the year, I was very happy to be able to give back and I’m glad you two enjoyed your weekend! Be glad you didn’t get to the IMS sale earlier, I got there about 30 minutes after they opened and it was a madhouse! I had two arm loads of stuff but had to wait in line over 30 minutes to check out. I got a good haul though, 5 tshirts, a sweatshirt, 10 fridge magnets, two big flags, a small flag, a poster, a round thing to hang on the wall, a dvd of the 100th running, a xmas tree ornament for mom, a coozie, a poster, 2 large diecasts, a medium sized diecast, and a small diecast, all for $160. Click the link to see it all. Thanks George, when we come over in ’20 for the 500 we plan to go to St Elmo’s. But what on earth is “imitation” lobster??? It can be fairly good. Not as good as the real thing obviously, but I’ve eaten plenty of imitation crab in my day. I trust your judgement. I’ve never heard of it over here, maybe they just don’t tell us!! It was funny that I recognized you at the game and it was fun to meet. 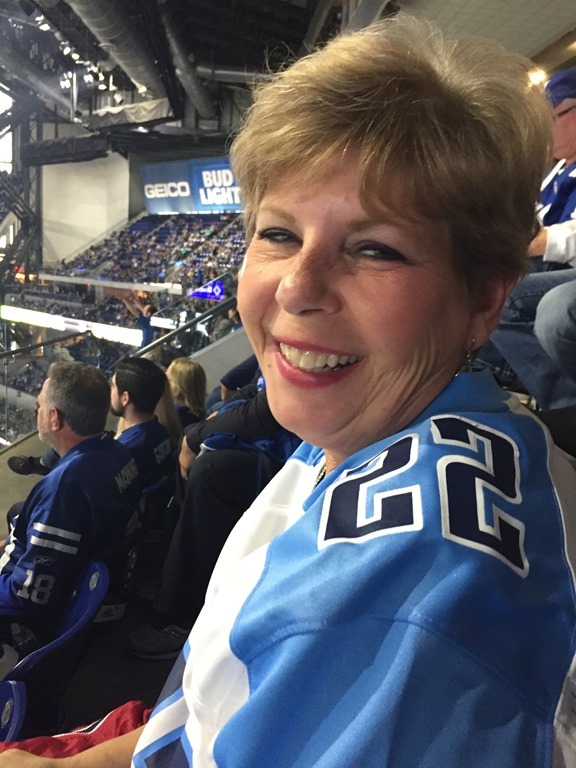 I love your blog and I’m glad you had another great time in Indy. Susan has quite a wonderful smile. 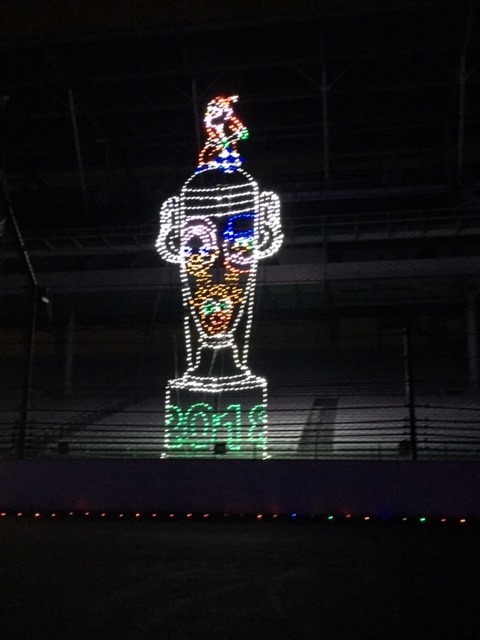 Santa on top of the Borg-Warner Trophy display was a nice touch. What fun! Thanks for sharing your adventure. We didn’t get to see the Titans’ game, but I did check the score a couple of times. Glad you could take it in stride. 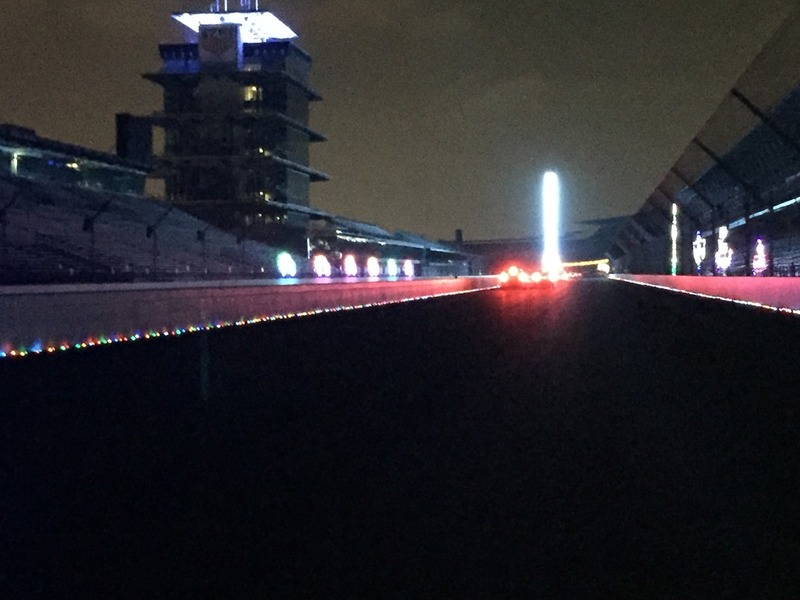 Thanks to “Photographer Susan” for the pix of Lights at the Brickyard. I’m usually not one to say “never,” but I do have a travel ban against driving anywhere north of Tennessee after October 15 and before April 15. Consequently, it’s unlikely I’ll ever get up there at Holiday time to see it. (Believe me, I had my share of snow when I lived in Indiana and Ohio, so it is NOT something I care to see again.) Glad you enjoyed St. Elmo; that is something EVERYONE should experience at least once. And then, there was the game. I’ll leave it at that.